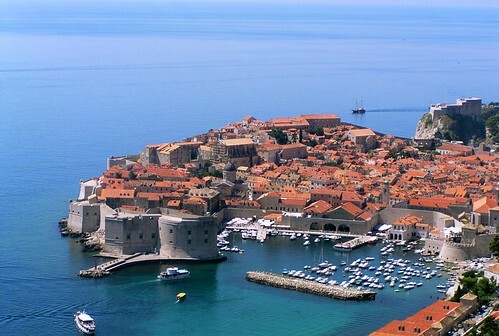 Sitting along the Dalmatiancoast of Croatia is the city of Dubrovnik. Nicknamed the Pearl of the Adriatic, the old city was named a Unesco World Heritage Site in 1979.The city was founded in the seventh century and is considered one of the ten best medieval walled cities of the world. The city boasts Europe‘s third oldest pharmacy established in 1317. Many old buildings were destroyed in an earthquake in 1667 but several still remain. Among the cities highlights are the Sponza. Palace which now holds the National Archives; Rectors Palace, St. Saviour’s Church -all dating back to the Renaissance as well as the 18th century St. Blaise’s Church. The wall of Dubrovnik is one of the main features of the city which is a popular tourist destination featuring many top class hotels. Each summer a festival known as the Dubrovnik Summer Festival is held in the city. The festival is 45 days long and involves concerts, games, and live plays.With a Mediterranean climate Dubrovnik has hot dry summers and wet winters. It has its own international airport is also accessible to the rest of Croatia by highway.It is used as the location of King’s Landing in HBO‘s series Game of Thrones.